In addition to our field staff that is meeting and greeting and dispatching, we have trained professionals that can serve as your group’s travel staff. They can augment your staff at your hospitality desk, or serve alone. They know your program, all the Island has to offer, and the hotel. From creative Beach Olympics to Sailing Regattas, to Road and Boat Rallies, to our signature Helicopter Scrabble, and our favorite team building is when we are able to organize a community project on behalf of a client and those in need on our islands benefit as well. Our signature “Pirates of the Virgin Islands” event is unlike any other, as is our “Caribbean Fire”. Elegant, creative, unique, wild are all appropriate adjectives to apply to the events we do. 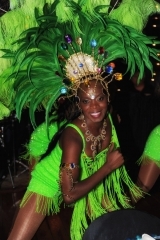 We can provide a wide variety of entertainment options for your off property events. We work with outstanding photographers who can do still and motion photography using the latest technology. They have the capability to produce and edit an entire presentation of your program to play on the final night, and have a CD/DVD for all to have as a memory. Working with AV specialists, we can see that all of your AV needs for events off the hotel property are met. Beach Survival Kits, Welcome Baskets, Snack Baskets, Local Arts and Crafts not to mention everything from Waterford Crystal to Rolex Watches…and remembering that the Virgin Islands are duty and tax free we can source it all at very reasonable prices.